“‘Tis the season to be jolly…” and other Christmas music is playing in stores, our homes and even our cars. So, it’s no wonder that you’re ready to kick-start the holiday season. And one of the best ways to do this is with your outdoor Christmas lighting. Realize that outdoor Christmas lighting is a labor of love. Understand that the lights will get tangled. Your assistant will annoy you. You may even come close to sliding off your roof. But it will all be worth it when you pull the switch, and your outdoor lighting is so magnificent, your house can be seen from space. Use C7 and C9 outdoor lights for maximum lighting coverage at an affordable price. 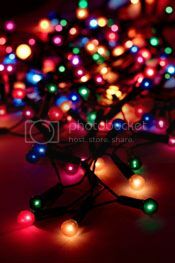 You can generally purchase these lights inexpensively, and they’re convenient, because each strand comes with 25 bulbs (you can attach up to six strands together). Go “green” with your outdoor Christmas lighting by using LED holiday lights, which can reduce electrical use by up to 80 percent. These lights come in a variety of colors, last up to 50,000 hours and are pretty inexpensive. Make the job of decorating bushes easy with Christmas net lights. As the name implies, these outdoor Christmas lights “net” bushes for a uniform lighting look. Most net lights come in 24 ft. lengths. Capture the look of melting ice with icicle lights, those mini strands of lights that drape off gutters, railings and banisters to create the traditional Normal Rockwell holiday vision. Your outdoor Christmas lighting will seem magical! Go extra fancy with Christmas spotlights. You can spotlight a cute winter display and pull onlookers’ attention towards your star attraction with these this type of outdoor Christmas lighting. This entry was posted on Thursday, November 22nd, 2012	at 2:09 pm	. You can follow any responses to this entry through the RSS 2.0 feed. Both comments and pings are currently closed.